Thanks to decades of experience and continuous collaboration with our customers, we purpose Microfiltration process for water treatment of general industrial use and specifically for the dairy industry. Whey microbiological stabilization. In order to reduce undesirable microorganisms reduction (mainly spores, bacteria, yeasts), whey is processed through ceramic membranes having retention capacities from 0.8 to 1.4 µm and with particular geometric shape. The obtainable reduction levels go from 104 to 106, in accordance to the microorganisms type and their concentration. The “stabilization” with ceramic membranes is done at +40/50°C and, compared to flash pasteurization (+72°C), has the advantage to not denature the proteins. Even sometimes it is necessary a further pasteurization process, the use of ceramic membranes is destinated to whey-by products for human purpose, since it can be reduced the total hot treatment times of the product and consequently to extend the shelf-life of the final liquid product. ESL milk preparation (Extended Shelf Life). Skimmed milk is micro-filtered by ceramic membranes having retention capacities of 1.4 µm and particular geometric shape for unwanted microorganisms reduction (spores, bacteria, yeasts). The obtainable reduction levels go from 104 to 106, in accordance to the micro-organisms type and their concentration. The shelf-life of the product even in this case is remarkable improved. Brine continuous filtration. Brine where the cheese is steep is continuously regenerated through the Microfiltration/Ultrafiltration process. It is sent with suitable flowrate to the UF/MF unit and the 96-98% (filtered) is reintroduced purified in the salting vat. The retentate (made by substances which bring to the brine progressive degradation if not eliminated in time) is discharged. In respect to the traditional process by fossil flours, the Ultrafiltration process does not foreseen expensive disposal of fossil flours and most of all ensures a constant superficial charge (towards low values), without cyclical contamination picks. The choice of Microfiltration process rather than Ultrafiltration depends on the dairy farm production requirements. Water purification. Ultrafiltration process is used to purify the well water used for cleaning and rinsing of the equipment. The treatment can drastically reduce the polluting microbiological elements as bacteria (including Pseudomonas or Escherichia coli), virus, yeasts, mushrooms, moulds, algae. 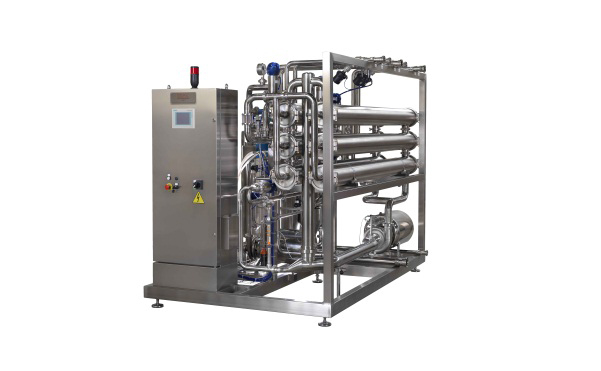 Water purification treatment can be made by Ultrafiltration process as well: the choice of one or the other technology depends very much on the available water quality and on dairy requirements. 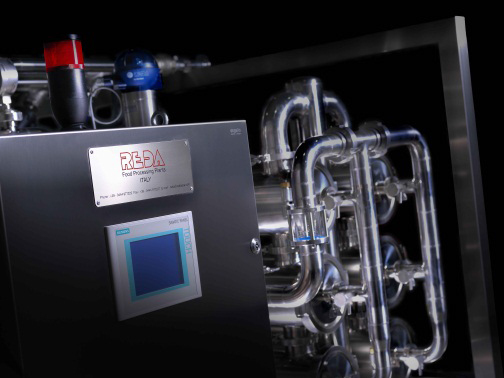 Continuous purification of mozzarellas water hardening. Mozzarella cheese water hardening is contaminated with time and needs frequent reintegration in large quantities. if this refill is not done, the risk may be the microorganisms growth (example: Pseudomonas family). These microorganisms, often present in the well water, can bring to unwanted phenomena of blue or pink colouring on mozzarella cheese surface. Microfiltration/Ultrafiltration processes enable to continuously remove such microorganisms and save large quantities of water. As in the brine purification process, Permeate (filtered) is reused and Retentate sent to the discharge or to the treatment. The choice of Microfiltration process rather than Ultrafiltration depends on the dairy needs, on microorganisms type and their concentration.